Watching US news coverage about Gaza for the past three weeks, I could imagine how the Nazis manipulated a nation to become complicit in the gassing and killing of millions of people. Zionist propagandists have equally neutralized public opinion in a surreal Orwellian world of doublespeak and doublethink. The American media has turned into a Zionist megaphone, rationalizing the murder of children playing on the beach or hiding in UN shelters. Like Joseph Goebbels in Nazi Germany, Israeli Prime Minister spokesman Mark Regev has become a regular on US networks preaching about “missiles raining on Israel”. But then the Israeli story took a sudden twist when the FAA banned American airlines from flying to Tel Aviv, forcing a complete turnaround in Zionist newspeak on complicit US media outlets. Responding to the FAA decision, former New York mayor Michael Bloomberg joined the Mayor of Jerusalem to speak with CNN reporter Zev Barak, otherwise known as Wolf Blitzer – the former media propagandist for AIPAC (American Israel Public Affairs Committee) – to tell viewers the FAA was wrong and that Israel was very safe. The sanguine Mayor of Jerusalem bragged about how “his” city was safer than US cities. Bloomberg added that the Israeli airport was safer than US airports and criticised an American travel advisory warning about travel to Israel and the West Bank. “If you don’t feel safe here (Israel), I don’t know where…” he said. To prove his point, the former Jewish mayor of New York flew to Tel Aviv on the “safest (Israeli) airlines to the safest airport”. Unsurprisingly, the contradiction from one day to the next went unnoticed by the ex-AIPAC propagandist. In its coverage, the US media is abdicating Israel’s moral culpability for targeting residential neighbourhoods and killing civilians. It’s a propaganda theme as old as Israel is. The current Israeli Prime Minister echoed the same melody on CNN. 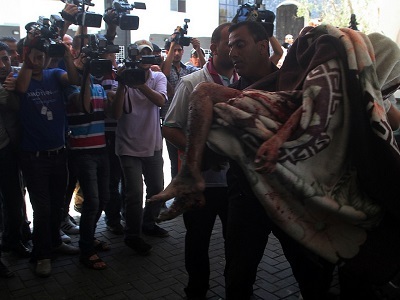 “They want to pile up as many civilian dead as they can… They use telegenically dead Palestinians for their cause. They want the more dead, the better,” he said. It is ironic that this statement is being offered by a Zionist who has exploited the “pile up” of dead Jews for the last 70 years. Zionists built museums in every Western capital with black and white photos of starved dead bodies dumped in ditches to justify stealing Palestinian homes. The Palestinians continue to suffer today because of Zionism’s use of those 70-year-old photos. Zionist propagandists want viewers to believe that the ground invasion into Gaza was necessary to destroy hostile tunnels. This is far from the truth, the tunnels were built for defensive purposes and were used effectively by fighters to inflict a heavy toll on the invading Israeli army. But there are two key facts to be remembered from this war. First, Israel targeted homes and shelters murdering 1,000-plus Palestinians (80 per cent of them civilians), while less than 40 Israelis have been killed – 90pc of them soldiers. Second, the “Sderot Cinema” scene where Israelis – purportedly under “raining missiles” – sit on hilltops munching popcorn and cheering live bombs blowing up civilians in the heavily populated Gaza Strip. – Jamal Kanj (www.jamalkanj.com) writes weekly newspaper column and publishes on several websites on Arab world issues. He is the author of “Children of Catastrophe,” Journey from a Palestinian Refugee Camp to America. A version of this article was first published by the Gulf Daily News newspaper. 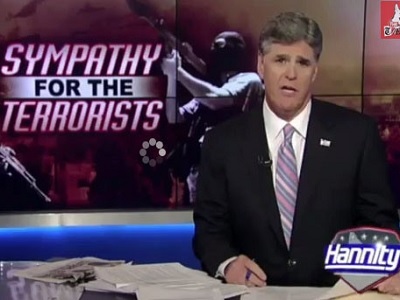 Don’t consider Hannity as a speaker for all americans. He is just an idiot extremist. The majority of American do not support at all Israel and they think is a terrorist state. I still have not heard or read one, “first-hand”, story of these missiles. Were one Israeli to prove the missile-story, that tale may seem factual. But, I’ve asked people to prove this, “fact”.and not one has. Instead, I get cussed-out and called names, for not taking this (newer) lie at face-value. You forget to tell your readers that the media personalities you malign have traveled to Israel, spent time on the border, observed first hand the devastation of Gaza and the continued targeting of civilians by the Hamas terror group. Sad, the condition of your country, the hate in the hearts of your readers and many Israelis. Amateurs, the whole lot of you.